we have a function mapping a vertex to the corresponding attributes, i.e. 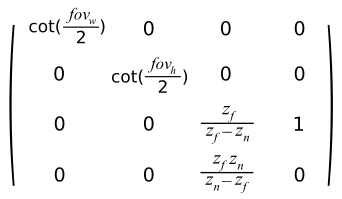 So, 1/zview is an affine function of xndc and yndc which can be interpolated linearly across the screen space (the transform from NDC space to screen space is a linear transform). In last section, we know how to interpolate the depth of a pixel linearly in screen space, the next problem is to interpolate the vertex attributes(e.g. texture coordinates). 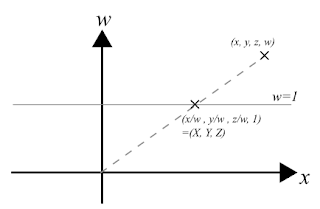 In view space, we know that those attributes can be interpolated linearly, so those attributes can be calculated by an affine function with the vertex position as parameters e.g. Therefore, u/zview is an another affine function of xndc and yndc which can be interpolated linearly across the screen space. Hence we can interpolating u linearly by first interpolate 1/zview and u/zview across screen space, and then divide them per pixel. 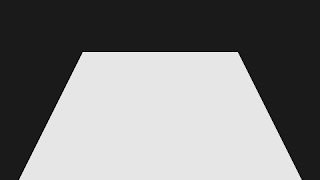 Now, we know that we can interpolate the view space depth and vertex attributes linearly across screen space. But during the rasterization state, we only have vertices in homogenous coordinates (vertices are transformed by the projection matrix already), how can we get the zview to do the perspective correct interpolation? 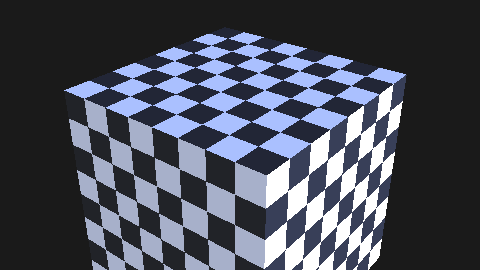 After transforming the vertex position, the w-coordinate will be the view space depth! 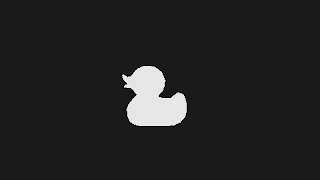 So the depth value can be directly interpolated using zNDC for depth test. 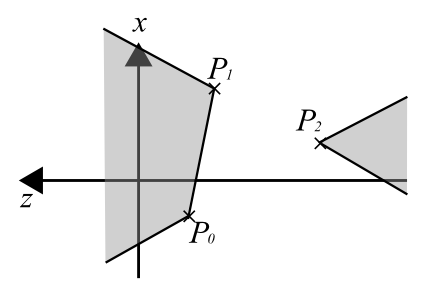 In this post, the steps to linear interpolate the vertex in screen space is described. And for rasterizing the depth buffer only (e.g. for occlusion), the depth value can be linearly interpolated directly with the z coordinate in NDC space which is even simpler. Software rasterizer can be used for occlusion culling, some games such as Killzone 3 use this to cull objects. So I decided to write one by myself. The steps are first to transform vertices to homogenous coordinates, clip the triangles to the viewport and then fill the triangles with interpolated parameters. Note that the clipping process should be done in homogenous coordinates before the perspective division, otherwise lots of the extra work are need to clip the triangles properly and this post will explain why clipping should be done before the perspective division. The interesting point comes when the w component is equals to zero. Imagine the w component is getting smaller and smaller, approaching zero, the coordinates of point (x/w , y/w , z/w, 1) will getting larger and larger. When w is equals to zero, we can represent a point at infinity. 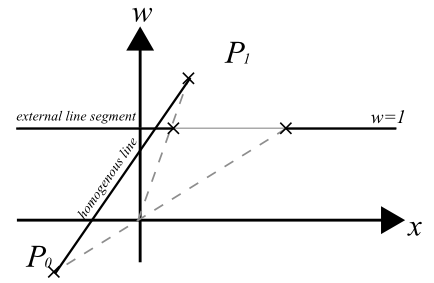 The projected line on w=1 is called internal line segment in the above case. But what if the coordinates of P0 and P1 having the coordinates where w0 < 0 and w1 > 0 ? 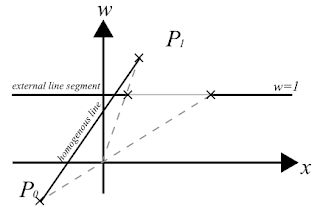 In this case, it will result in the above figure, forming an external line segment. 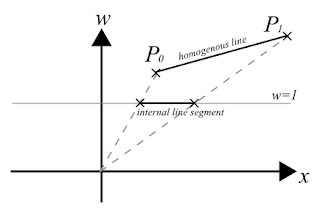 It is because the homogenous line segment have the form L= P0 + t * (P1-P0), when moving the parameter from t=0 to t= 1, since w0 < 0 and w1 > 0, there exist a point on the homogenous line where w=0. This point is at infinity when projected to the w=1 plane, resulting the projected line segment joining P0 and P1 passes through the point at infinity, forming an external line segment. The blue line shows the viewing frustum, nothing unusual for the region in front of the eye. The unusual things are the points behind the eye. 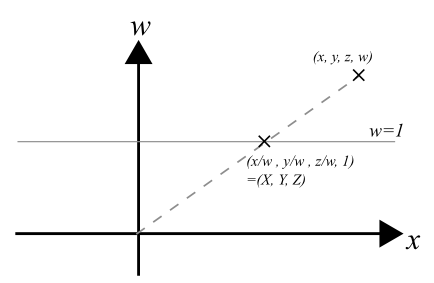 After perspective transformation and projected to w=1 plane, those points are transformed in front of the eye too. So for line segment with one point in front of the eye and the other behind the eye, it would be transformed to the external line segment after the perspective division. 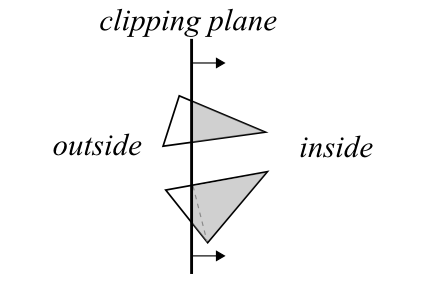 In the left photo, it shows an external triangle with one of the triangle vertex far behind the camera while the right photo shows the full view of the triangle and the cross marked the position of the camera where the left photo is taken. Then the clipped triangles can be passed to the next stage to be rasterized either by a scan line algorithm or by a half-space algorithm. Below is the clipping result of an external triangles with 1 vertex behind the camera. And lastly special thanks to Fabian Giesen for giving feedback during the draft of this post.